Jamais is a long time, though, and the last of our hesitation disappeared when we told our internist we were going to Paris for a month and she literally wriggled with joy while describing how much fun she and her husband had just had zipping around the city by Vélib’. She shrugged philosophically about the lack of helmets, and we’ve since read that the odds are slightly better than you’d think, because Paris drivers are trained by daredevil scooter drivers to look in all directions for possible hazards. It turns out, too, that once you start looking for them, there are dedicated bike lanes all over; and bikes are allowed to use the lane reserved for taxis and buses. We spent two happy days of our trip on Vélib’ bikes, tootling first around the Bois de Vincennes and then along the Coulée Verte (east of the Bastille, it’s the continuation of the Promenade Plantée I’ve written about before), and if the weather had cooperated, we’d have taken more rides. We cobbled up padding and a restraint for Chloe, who leaned forward like a figurehead, ears blowing in the wind, and cemented her position as Best Dog Ever (except for yours, of course) by shrugging off two wipe-outs. Here’s what we learned. 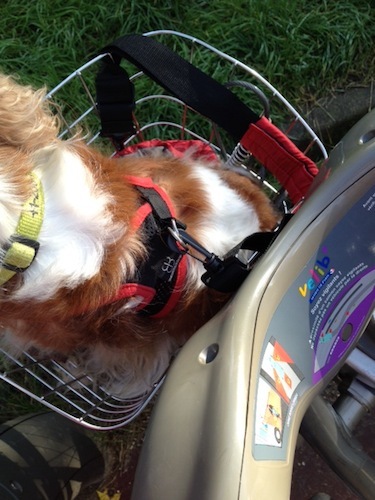 Is your dog small enough to fit in the Vélib’ basket? The basket on the front of a Vélib bike is 15″ long, 12″ wide, and 8″ deep. That’s big enough to hold 13 lb. Chloe, sitting down — I think a dog up to about 15 lbs. would be as comfortable as she was, and smaller dogs might even be able to lie down. If so, and if you think (or already know) that your pup will consent to being chauffeured, your next task is to come up with a way to pad the basket’s bottom. The mesh is made of thin wire, and it’s loosely “woven,” so it would be uncomfortable to sit on, and the gaps would allow paws or tail to poke through and be injured. Happily for us, I had in my purse the small pad that we brought for Chloe to lie on in restaurants, and that, folded in half, worked beautifully. If I lived in Paris, I would create a large fleece shower cap, essentially, whose elasticized edges I could hook over the basket’s rim, and then I’d put padding in the bottom of that. As it was, I worried about the padding shifting under Chloe and exposing one of those gaps, but it didn’t happen. You’ll also want to have some way to restrain your pup, not so much from leaping out of the basket (because if you think she’ll do that, you should go with another option, see below) but from fleeing the scene if you and she go fanny over teakettle. There’s nothing provided with the bike that will help — there is a thin cable, much of which flops into the basket, that can be used to lock the bike up temporarily, but it’s so long and twisty (and the locking mechanism is so fiddly) that I wrinkled my nose and dove back into my purse. Chloe with pad under her, shoulder strap clipping harness to basket. DO NOT restrain your pup by her collar — ONLY by a harness. Seriously. Help me sleep at night. Alternatively, consider carrying your pup in a backpack. You could bring one with you, or buy one in Paris (stores like Moustaches and I Heart My Cleps have good-quality backpack carriers, and inexpensive ones are available in many of the neighborhood quincailleries — ostensibly hardware shops, but they sell everything, including luggage). I also suggest buying a copy of Paris By Bike With Vélib’, either before you leave (I’ve provided an Amazon link below) or once you’re in Paris (we found our copy at the English-language bookstore W.H. Smith at 248, Rue de Rivoli). It suggests seven scenic routes and lots of useful addresses and tips. We did Route #4 (“The countryside in Paris”) on our second day out, and liked both the ride and the guidance the book provided. While you’re stocking up on things, buy the Univélo phone app, which shows you where the nearest Vélib’ stations are, and how many bikes/spaces are available at each. You’ll do research separately about using Vélib’, I know, and there are plenty of blog posts and articles out there for you to learn from. These are just the things that caught my attention as we came up to speed (so to speak). Dealing with the terminal: The terminals wouldn’t take American credit cards, which wasn’t a huge surprise. [Reader Jessica points out, quite correctly, that the issue is the presence or absence of a microchip — her Visa Marriott rewards card has a chip (and no foreign transaction fees), and it works fine in places where ours didn’t. Please also see Roberta’s comment, below.] The workaround is to fire up your laptop before you leave your apartment or hotel room and buy your day’s ticket ahead of time, noting down the code Vélib’ provides. When you get to the terminal, follow the directions that let you use that code to release your chosen bike. 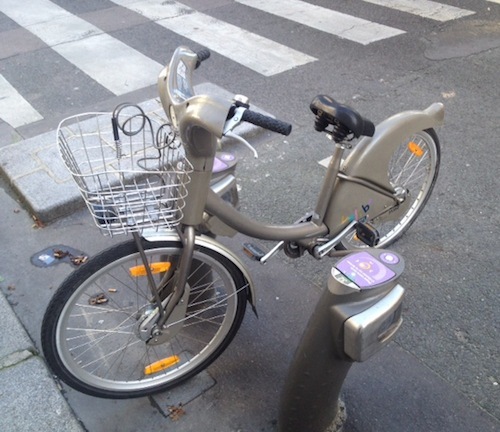 Selecting a bike: If there are only a couple of bikes in a Vélib’ stand, whether you see it in person or on your Univélo app, it’s likely that those are broken bikes. Most bikes are in good shape, but before you set off — and indeed, even before you unlock a bike — do a handful of things to make sure it’s a good choice. Don’t be shy — we saw innumerable locals doing all of these things, just more quickly and efficiently than we did. Lift up the rear end and turn the wheel with your foot on the pedal, first backward (to ensure that the chain is well seated) and then forward; use the right brake and assess how well it works; give the front wheel a spin and use the left brake to stop it. Check tire pressure with a squeeze of your hand or just by leaning your weight on each wheel in turn and looking for undue squishiness. Give the seat a tug to make sure it’s solidly in position (if not, squeeze harder on the stem clamp); if the seat is too low or too high, either choose another bike with a seat in the position you prefer or loosen the stem clamp and adjust up or down (despite all these precautions, a Parisian friend tells me she sometimes finds herself sinking lower on her seat as she pedals — if that happens to you, pull into the next Vélib’ station and swap). A broken bike will often have its seat turned around to indicate a problem. Safety issues: Before you set off, practice ringing the bell with your left hand. It’s the most effective way you have to warn people out of your path (and people do tend to stray into bike lanes). With a dog in the basket, the front end of the bike is heavy and prone to swooping to one side or the other. Notice, too, that these are step-through bikes, so there’s no cross-bar to prop against your leg. Take your hands off the handlebars only when you’re confident that the front end is solidly braced against something. Even if your pup isn’t injured by a sudden movement, it won’t take too many alarming experiences for her to decide against this whole biking thing. 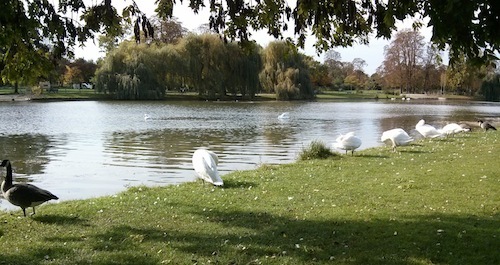 For your first ride, choose a large park like the Bois de Vincennes or the Bois de Boulogne, and choose a day and time when you’re less likely to have a lot of company. 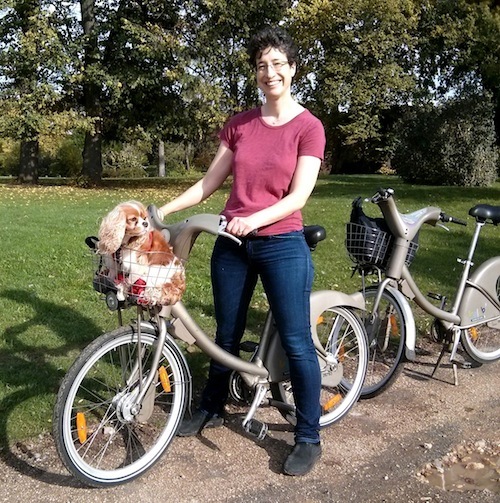 The Vélib’ bikes are surprisingly pleasant to ride, but you’ll want time and room to get used to them, and especially to having your dog’s weight on the front end. It worked well to spend the first day in the park, flirting with its outskirts every so often to see what Chloe thought of streets, and then exiting the park mid-afternoon to ride through the (very) light traffic of Saint-Mandé. On our next trip, we rode in dedicated bike lanes, next to but not in traffic, and that too went well. Returning your bike: The whole point of the system is to keep bikes in circulation, so your day (or week) ticket gives you only 30 “free” minutes at a time. If you use your bike for longer than that, you pay an extra fee — it’s initially trivial, but it escalates rapidly. There were a couple of times when we shrugged and absorbed the extra fees because we were having fun a little too far away from a station, but we generally tried to scoot back in time. It’s an unadvertised fact that if you wait two minutes, you can check your bike back out again. Given that there were lots of bikes available when we were frolicking, we stood beside “our” bikes until the grace period ended. The right thing to do, however, is check your bike in (watch the light on the bike’s stand until it blinks from orange back to green — after all that effort, you really want the system to recognize that your bike has been returned), unload your bike, and then hope that no one snags it. You can improve the chances that no one will by returning it to a stand far from the terminal. If all of the checking-in and checking-out becomes vexatious, you could look into renting a bike for a day. No more worried glances at your phone or waiting for your timer to peep, and a bike rental place would likely be able to rent you a helmet too. On the other hand, there you’d be with a bike on your hands — no popping into a shop or a café without first finding a place to lock it up, and at the end of the day you’ll have to schlep it back to its source. The beauty of Vélib’ is that you can bike, or not, on a whim. The terminals do take American credit cards but they must have a chip in them. I specifically acquired a blue card from Amex with said chip to use with the Velib! I am french but I never go to Paris, but I like to read your articles. I wrote you in a old post on châteaux de la Loire. And I just phoned to Castle of Saumur, they do not accept dog same a little in a bag in a castle or in the garden. 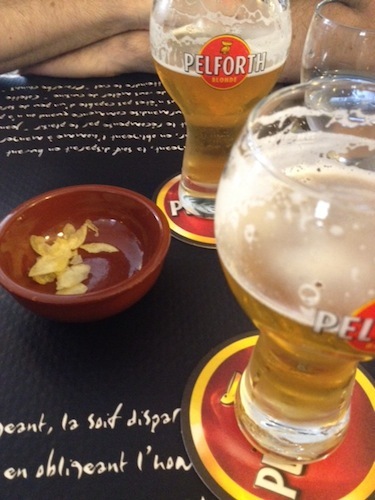 I phoned too.at Montreuil Bellay, but they do not accept dogs because they have two big dogs. Sorry for this informations. If you want I can continue to search when I have a moment. Thank you SO MUCH for the update! I’m copying your comment over to the post, and editing the post to reflect your news. I really appreciate your kind work on behalf of other travelers with dogs! !